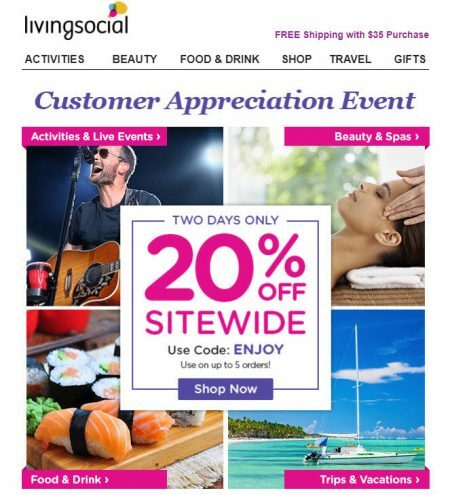 LivingSocial.com is having a Customer Appreciation Event. 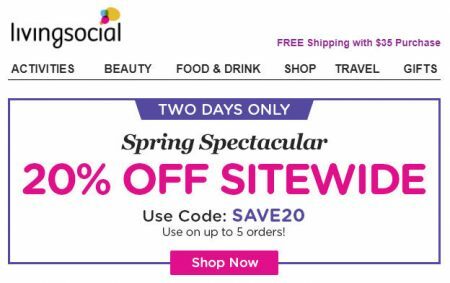 Save an extra 20% off sitewide (all deals) when you enter the promo code ENJOY at checkout. I’ve tested the code and can verify that it works. The promo code is available for 2-days only from Tuesday, April 10th to Wednesday, April 11, 2018. It’s good for purchases of any amount with a maximum savings of $50. 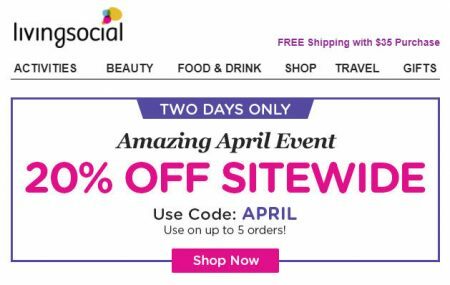 Save an extra 20% off sitewide (all deals) when you enter the promo code APRIL at checkout. I’ve tested the code and can verify that it works. The promo code is available for 2-days only from Monday, April 2nd to Tuesday, April 3, 2018. It’s good for purchases of any amount with a maximum savings of $50. LivingSocial.com is having a Do More, For Less Sale. 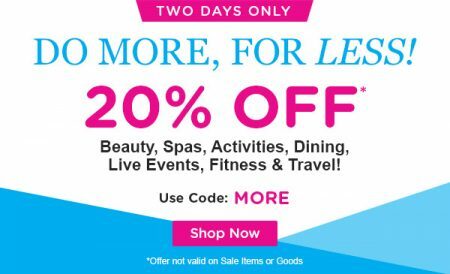 Save an extra 20% off Beauty, Spas, Activities, Dining, Live Events, Fitness & Travel when you enter the promo code MORE at checkout. I’ve tested the code and can verify that it works. The promo code is available for 2-days only from Tuesday, March 27 to Wednesday, March 28, 2018. It’s good for purchases of any amount with a maximum savings of $50. LivingSocial.com is having a Friends & Family Event. 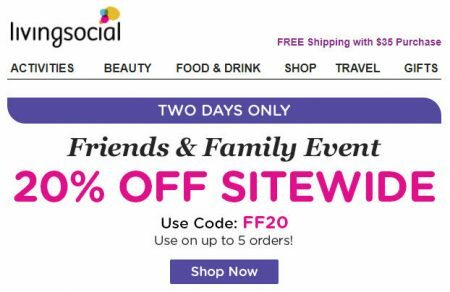 Save an extra 20% off sitewide (all deals) when you enter the promo code FF20 at checkout. I’ve tested the code and can verify that it works. The promo code is available for 2-days only from Wednesday, March 21 to Thursday, March 22, 2018. It’s good for purchases of any amount with a maximum savings of $50. LivingSocial.com is having a Get Lucky Sale. 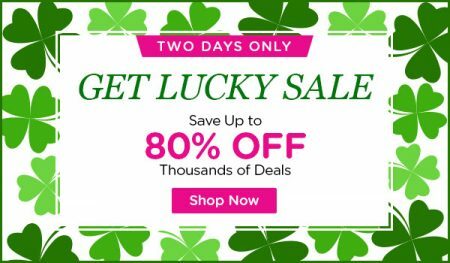 Save up to 80% on thousands of deals (Ie. spas, activities, restaurants, travel, and morre). Prices as marked; Valid on select deals. The sale is available for 2-days only from March 15-16, 2018.